A few months ago Bruce Springsteen and the E Street Band's tour of Australia was officially announced. A few months before that I had a spam email from online music retailer PopMarket with an eye-catching offer: A Bruce Springsteen Live DVD bundle for $26 - with free postage. Fearing the rumours I had heard of the Australian Wrecking Ball tour were in fact nothing more than rumours, I really wasn't going to miss out on such a great bargain. 1 - The Live in New York City set which I first stumbled upon late on BBC2 one night in 2001 that came a couple of years after I was first introduced to Tracks and sealed my appreciation of everything E Street and essentially started my increasing borderline obsession with seeing them live at any given opportunity. 2 - The London Calling: Live From Hyde Park concert, which I managed to get to the front row, received a tip of the hat from Clarence Clemons and even made a close up appearance in the final DVD edit two minutes into the band's performance of Born To Run. (Wearing the stars and stripes bandana). So this DVD bundle was ordered in September 2012 and I expected it to arrive a few weeks, maybe a month later what with it travelling all the way to Perth. 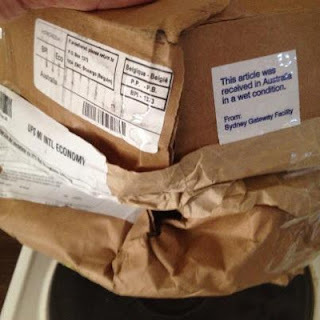 Complete with stickers saying it had travelled through Belgium, and "was wet when it arrived in Australia". I actually received the parcel on the same day I wrote a short news story about a young English boy's message in a bottle that had left the north coast of England and washed up on a beach in Perth some 15 months later. From the state of the package I wondered it had made a similar journey. Amazingly the contents of the parcel seem completely unaffected by the delivery. And now have been added to the three Bruce and E Street biography gifts I recently received that have become my unofficial research for my upcoming trip.